I read with interest the official summer weather recap by Environment Canada’s Chief Climatologist Dave Phillips, saying that our past summer was ‘delightfully boring’. Are you fugging kidding me? Any seasoned gardener loves boring and predictably lovely temperatures that we can count on in our very short growing seasons. Ah, how soon we forget! This past spring and summer were anything but boring in my books. I do recall extremes from one end to the other, don’t you? Is it just me who recalls our very wet and very cold spring? I lost one third of my plants to grey mould. All I could grow were wild mushrooms. Even in my containers. After such a particularly crappy, cold wet spring, a boring summer would have been welcomed. 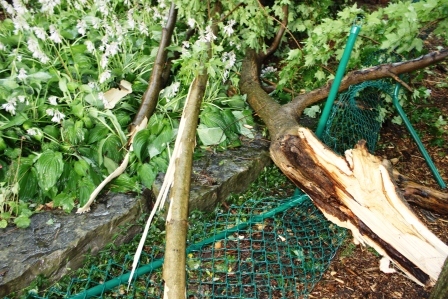 By the time I’d recovered, replanted and breathed a sigh of relief, all of my gardens were completely flattened by the wicked and so-called ‘tornado’ that didn`t actualy touch down in mid July. 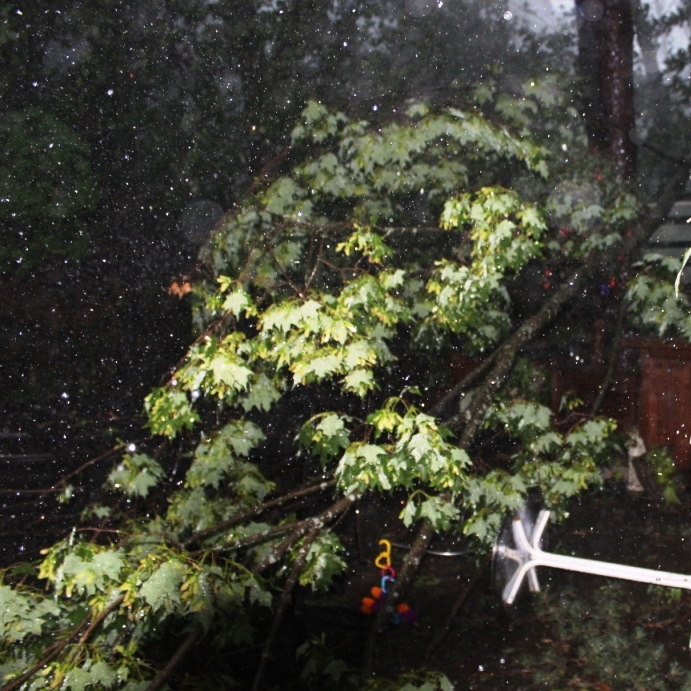 My front trees were on the neighbour`s roof. This was not boring, not by a long shot. Even our friend Dave Phillips called this rain storm epic. 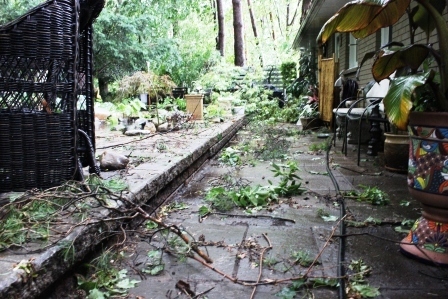 “After two exhausting days of storm clean up, I’m reminded of something elemental, a garden parallel as it were. Sometimes we need serious damage in our lives to make us appreciate what we have. I love the photo of my newest astilbe still standing while everything around it was blown to smithereens. Hail storm. Astilbe still standing. I watched from my front door as my baby tree form limelight hydrangea blew parallel to the ground. But not uprooted. 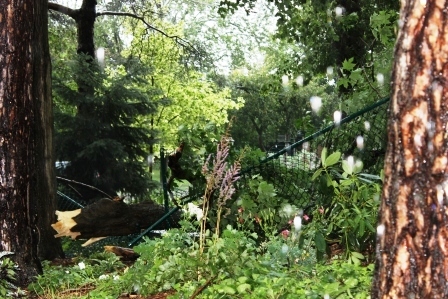 How, I don’t know, when massive branches fell all around. 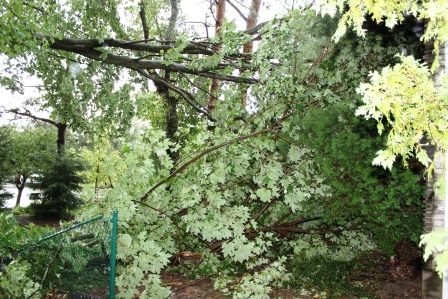 Decades old neighbourhood trees were uprooted. But that wee babe withstood the storm somehow, even though it was directly in the path of those 100km/hour winds. I was actually racing from front door to back door, in the dark without power, yelling NO. No. No. No! Please! The following morning one of my new oriental Star Gazer lilies blossomed. Stressed? Perhaps. But there it was. Amidst the chaos around it. Standing proud, with its undeniably outstanding beauty. Just like the sun bursting out the evening before, after all went black as night for those ten minutes of fury. As though it was offering a reprieve…giving neighbours the opportunity to walk around, providing help to those who needed it. It became, suddenly and unexpectedly, a lovely summer evening. Another parallel. This storm episode also reminds me of when I’m down with a terrible flu, sick as a dog. It doesn’t happen often, but every single time it does, it reminds me how wonderful life is when I’m not down for the count. It’s always my way of understanding that I needed to be just so sick to appreciate all the very good days I have and sometimes let slip by without a thought of gratitude. And so I’m grateful that the storm that left my pond and koi in a murky ugly mess — was nevertheless, incredibly back to its equilibrium by the next morning. Am I cranky? Oh, I am. If we Canadians are so good at talking about the weather, let`s at least discuss it the way it was. Not the median temperature overall. Pardon me. If our summer rainfall averages out to such and such, should it not be noted that most of that fell in one or two days instead of a `boring`to be expected average of summer months. The hottest day recorded this summer was in September. We`ve had three, THREE, frost warnings in the first three weeks of September! Never mind another epic rainfall this past Saturday when my pond flooded twice. Grrrrr. At the very least, someone, anywhere, needs to be remembering. And recording. 5 yrs ago it seemed huge. Now? Read on.